It was over lunch at Pondok Sari Wangi in Gadong with restaurateur Riduan (@pondoksariwangi), Eric (@mrbakersbakeshop) and Jayden (@jaydensia) on 25 October 2011 that I got inspired to dig for foodie movies from Japan. Riduan suggested Eric to expand his galore of exquisite pastries, drawing inspiration from Japan. Pondok Sari Wangi is a Premier restaurant serving authentic Indonesian culinary delicacies. It has been in business for over 20 years. To date, there are 7 outlets in and around Bandar Seri Begawan. Of course, there are tonnes of pictures and information on the web, but movies made about patisseries and boulangeries are rare. Until I chance upon the 2011 film, Patisserie Coin De Rue, a title in French meaning The Corner Pastry Shop. Except for a few expressions in French and English, the lingua-franca is Japanese. This movie makes men look like jerks. I won’t be apologetic for my language here. First there’s this shadowy master patissier, Tomura (Yosuke Eguchi) who gave up making sweet cakes 8 years ago. Second jerk is the star’s boyfriend who, after coming to Tokyo from Kyushu, stood her up for another girl. Now we all have seen this, heard that and it’s all happening again. The third, and I’ll put it mildly is the Corner Pastry Shop co-owner, Julian – the French cake maker – who doesn’t have any key roles except for the fact he is French and he co-owns the patisserie. What a waste of talent for a side-kick that wouldn’t do ban-zai kicks and chops. The story begins with Natsume (Yu Aoi), a country girl from Kagoshima, Kyushu who has come to Tokyo to look for her boyfriend. No, to chase her missing boyfriend, only ending up making French pastries instead. Her boyfriend has come to Tokyo to work at this corner pastry shop. To her dismay she finds out he has quit and not told anyone where else he is going. On leaving the patisserie, she notices a vacancy sign in the front of the shop. She enquires but owner Yuriko (Keiko Toda) rejects her in situ. Not to be wrestled a second blow having come this far to Tokyo, she begs and her determination wins. Yuriko’s French husband, Julian (Nathan Berg) appears in the film several times. His role is more for window dressing, a mannequin, than to lend credence to the Frenchness of the movie title. Neither does his role impart any baking skills, except greeting some customers, sweeping the yard, setting some tables. This movie could easily have been made without him. His presence could be due to Japanese obsession to glamourise western and French cuisines; expenses be damned. Patisserie Coin De Rue won The Best East Meets West Cinema Award at the 2011 Santa Barbara International Film Festival. Three Cheers!!! 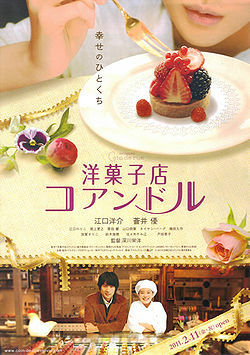 Like quite many other Nippon foodie movies featuring heroines who find their raison d’etre in the kitchen, the heroines in this movie are Yuriko, Natsume and the shop’s skilful pastry chef, Mariko (Noriko Eguchi). So, where are the men? Useless bums and losers, that’s who they are portrayed to be. The once famous, no, the lengendary Tomura dropped out of industry 8 years ago. Julian the “mannequin” and Natsume’s boyfriend….er, what’s his name again? Indeed the men are insalubriously subterfuged to oblivion and waste. Natsume apprentices hard. While she receives moral support and encouragement from a senior lady patron (Mariko Kaga), the skilful chef Mariko is her dark-horse nemesis. And the regular patron, Tomura himself drives her up the wall with his cold and withdrawn characterisation. Between Natsume and Mariko, envy and jealousy rear their ugly tails. Do we need more? The plot is so readable, it’s like a set menu. Men are jerks – weak and lost. Women are the longsuffering heroines, and when there is more than one of them, there’s grudge and malice between them. As the menu-like plot would have it, this story evolves around a familiar moral: to live life to the fullest while not losing sight of one’s goals. Life, indeed, goes on. The broken-hearted and rejected Natsume is transformed from zero-to-hero. The old heroine Yuriko fades and Natsume’s adversary Mariko dissipates too. One day, Yuriko falls from the stairs, breaks her arm and decides to close her pastry shop (what??). Mariko got sold out to a rival offer and regrets it. And the man with a dark mysterious past? Tomura’s grief and tortured soul gets a replay and he is able to breathe new rigour into his life to reclaim the legendary pastry king status. Finally, Natsume leaves Tokyo, symbolically descending to the valley, to become a professional pastry chef. The movie, Patissierie Coin de Rue, by Yoshihiro Fukagawa, is not a blockbuster. The moral values are good, albeit obvious and predictable to the viewer. The plot is weak and immature. However, the unifying ingredient which energizes the movie is Yu Aoi’s acting as Natsume. Her cheerful voice, her determined spirit, and that beam of sunshine exuding from her strong willed character make this movie palatable. That said, I recommend this movie as “Watchable”.